Everyone reading this article has had some type of dream or aspiration in their lifetime from childhood to whatever age we might be. Those dreams and aspirations change over the years, but some remain the same. We are always chasing dreams and dreams are something that no matter the age we should never give up on. In baseball, the dream of making it to the majors comes at a young age and carries very long odds. Just being drafted or signed to a professional team is a dream come true in its own right. That’s where everyone takes a different road to the majors. For some like Bryce Harper or Kris Bryant, the path to the majors is like driving on the Autobahn at high speeds in a Porsche, while for others like Jake Brigham the road to the majors has taken a number of twists and turns. Jake Brigham is what Chasing The Dream is about. No matter the biggest up or the lowest down, Jake Brigham continued to chase his dream. Every pitcher fights through injuries from time to time and in a career probably has had more than their share of stints on the disabled list. Brigham is no different, he has fought through his share of pains and strains but he also has missed substantial time because of injuries as well. A few seasons into his professional career as a young 19-year-old an arm injury side lined Brigham. His entire 2008 season was wiped out by the three words a pitcher never wants to hear, Tommy John surgery. Even finding out the news of the surgery is hard to take but then finding out you cannot pitch for a full season is even harder psychologically. Through long months of rehab, Brigham was able to mature and become more determined than ever to make his way back to the pitcher’s mound. 16 months of hard work later, Brigham saw action on the mound for the first time. In 2012 following a trade to the Cubs, Brigham experienced right elbow pain and was shut down for the remainder of he season. The injury caused the Rangers and the Cubs to revisit the deal in the offseason and Brigham was sent back to the Rangers in exchange for Barrett Loux. Luckily for the right-hander another major surgery was not needed and he marched on with his career. Throughout Brigham’s development in the Rangers system he was used primarily as a starter. That all changed in 2011 when he began bouncing back and forth between the starting rotation and the bullpen. While it took some time for him to adjust to the bullpen, Brigham worked through the adversity and the different styles of preparation each role takes. He had some struggles but he worked through the ups and the downs and showed success in whatever roll the team assigned to him on a given night. From 2011 through 2014, Brigham started 71 games and came out of the bullpen an additional 40 times. For the first time in his career Brigham was added to the Texas Rangers 40-man roster in the off-season leading up to 2012. He seemed poised to be a pitcher who could be a big part of the Texas Rangers future either in the rotation or even in the back-end of the bullpen. While this was an accomplishment and seemingly a sign that Brigham was part of the Rangers plans they dealt him later in the season in exchange for Geovany Soto. As mentioned above, he was later traded back the following off-season due to an injury. After one more season with the Rangers, Brigham was no longer in the Rangers plans. A sure sign of how things can change in a career of a baseball player at any moment. Brigham spent the majority of the 2013 and 2014 seasons pitching the AAA level, Pitching with the Rangers and Pirates organizations. Brigham got off to a hot start pitching out of the Pirates AAA rotation in 2014 and there was talk that Brigham could be in line to help the Pirates staff if someone would go down with an injury. Instead the right hander spent most of June on the disabled list and never got the call he was hoping for. Being on the cusp of the majors for two straight seasons in AAA but not getting the call to the majors can be deflating. 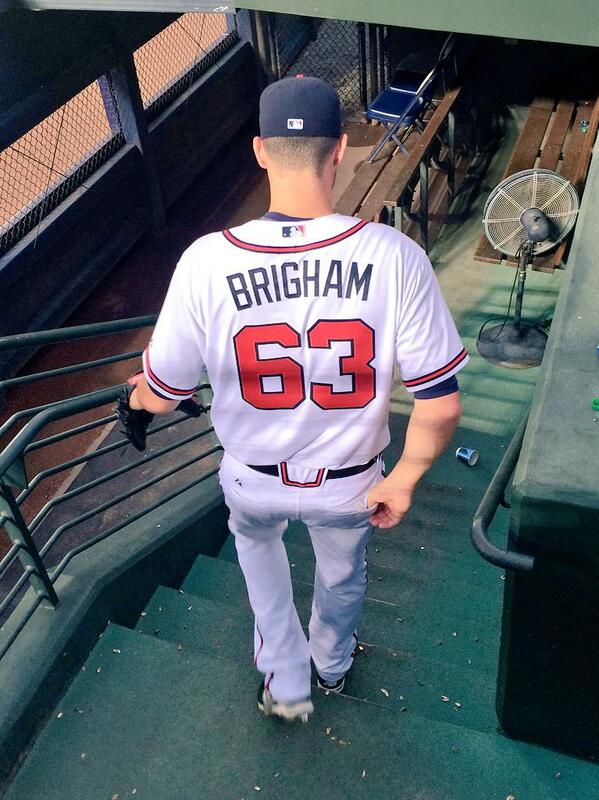 Brigham instead kept looking for an opportunity and found one with the Atlanta Braves organization before the 2015 season started. The opportunity didn’t start back in AAA or even with a shot at the major leagues out of spring training. It started in Mississippi as a member of the Braves Southern League affiliates starting rotation. For some players they may have opted to move on with life especially ones who have married and started a family. Brigham kept fighting and he kept clawing toward his dream. At the age of 27 and over two years older than the average age of the players in the league Brigham started his 2015 march to the majors. In a span from May 29 to June 17th, Brigham limited opponents to a .095 batting average and flashed an ERA of 1.13. Brigham also flirted with a perfect game on June 5th while pitching for the Mississippi Braves before allowing a hit in the ninth inning. Even though he was putting up unbelievable numbers many experts around baseball did not take notice. Josh Norris a writer for Baseball America one of the leading prospect authorities brushed off Brigham’s outstanding AA performance by saying “Because he’s 27 years old in Double-A”. The Braves took notice because they promoted Brigham to Gwinnett after his stretch of Double-A dominance. Pitching against a familiar face, the Indianapolis Indians, Brigham picked up a win in his first Triple-A appearance working in relief of Sugar Ray Marimon. That would be Brigham’s one and only appearance with Gwinnett before his manager Brian Snitker told him the news he had dreamed of getting from the first days he picked up a baseball. Brigham would be packing his bags and joining the Atlanta Braves in Pittsburgh and the next official pitch he would throw would mark his first in the major leagues. Atlanta after the game to prepare for a home stand featuring the Washington Nationals. In game one of the series Shelby Miller would face off against Jordan Zimmerman. Miller was hit hard early in the game and after five innings his pitch count exceeded 100 pitches. Brigham received the call to warm up and entered the game in the 6th inning. Brigham entered the game and pitches a scoreless 6th inning getting Bryce Harper to ground out to first baseman Joey Terdoslavich to end the inning. In his second inning of work Brigham picked up his first major league strike out getting Wilson Ramos swinging. He would later pick up his second strike out of the inning freezing Ian Desmond for a called third strike. In his final inning of work, Brigham picked up two more strike outs (Micheal Taylor and Danny Espinosa). Over the course of his three innings (48 pitches/27 for strikes) of work Brigham’s flashed a lethal looking slider to go with his power fastball which touched 94 more than one time in his outing. While it is just one game in a long 162 game schedule. it was a dream come true performance that Brigham and his family will remember for a lifetime. Brigham’s story is a prime example for everyone out there not to ever give up on your dreams because with hard work, support, and believing in yourself you can succeed. Please like Chasing MLB Dreams on Facebook and follow us on twitter @CTD_Sypien as we continue to feature and follow all of our featured players as they chase their way to the major leagues.